Inspired by this valley, these local businesses have expanded well beyond it. The demographics of people getting joint replacements are changing—they’re younger than ever. For better or worse, Jackson Holers are a great case study. This valley brings out creativity. 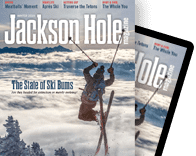 Locals love to hate that there is no home delivery of mail in Jackson Hole. Sleep your way to better physical and mental health and performance. Trade happy hour or, even better, an after-dinner drink for a mountain bike ride. The latter is done by headlamp, which makes it a totally unique experience. Once strictly an amateur, Ali Dunford has turned the art of ‘dumpster diving’ into a respectable profession.